On Thanksgiving morning in 2015, I woke up to a sun-soaked bedroom. Sergiusz, my husband of just over a month was still sleeping, his bare back curved slightly towards me. I gave him a squeeze and a light kiss on the shoulder before crawling out of bed for my morning coffee. It was Sergiusz’s first Thanksgiving in America. As a recent immigrant to the United States and a self-described foodie, he couldn’t wait. This was going to be his holiday. I pulled out my computer to spend some time journaling. Maybe I would write about our previous night enjoying craft beers with my brother who was fast asleep on our couch. Or, maybe I would reflect on the Thanksgiving one year prior when I sat alone in Prague eating a kebab in a dimly-lit restaurant nearby the communist-era building where I was living. What poured out of me was a love letter, a statement of gratitude. It was a 600-word stream of consciousness that I ended up printing out and bringing to Sergiusz in bed. I folded it in half and handed it to him. We had been facing a lot of personal challenges at the time. Immigration was stressful — financially and personally. Cohabitating was hard and marriage even harder. We were learning what it meant to blend our two lives and how it felt to love someone in such a real way that your own sense of self is shifted. He read my words and pulled me close. We were more than good. 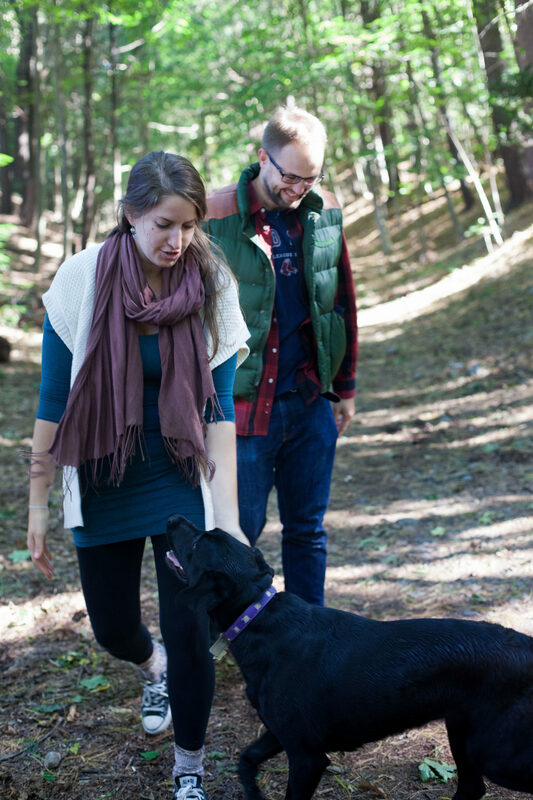 Rachael and Sergiusz with their dog, Sushi, just a week before they were married. October 2015. When someone dies, it is easy to forget these moments. Everything is clouded by darkness. Memories feel tragic and often times are never spoken about at all. It is easy to let grief overshadow gratefulness. I was lucky. There is no denying that. For the seven years Sergiusz was in my life, he was my best friend turned lover and life-partner. He believed in me and I in him. I gained in-laws who I adore and who I know adore me. Throughout our relationship, I inherited a European-identity, an appreciation for good food and wine and a passion for both politics and organic living. I could be weird around him (super weird) and he found it endearing and hilarious. He taught me to have confidence in my opinions and to hold my values close. He challenged me and cherished me. He taught me how to love and how to allow myself to be loved. This gratitude for what Sergiusz provided me is an awful guilt-laden feeling. One of the many contradictions of my life after his death. I recently spoke with my friend Katy, a fellow young widow, about this idea of gratitude within grief. Katy was one of the first women I photographed for my Welcome to Widowhood series and since has become a confidant, someone who can walk with me through a forest of loaded question marks. Her husband, Aaron, unexpectedly died on September 29, 2014 from a brain tumor; it was exactly 2 years before Sergiusz’s sudden death, to the day. “That is a very evolved viewpoint,” she said to me as I expressed my appreciation for what I once had over a Friday night Skype date. “Does it feel like you are betraying the grief?” she probed. “That is a good query. Maybe a bolster or a buoy in the ocean,” she suggested. Gratitude does not replace grief nor does it mask anger, resentment, and utter despair. It does not make triggers any less painful or the reality of loss any lighter. In fact, in can often times do the opposite. It is merely another complex emotion to wade through on the path forward. Sergiusz has a moment of total joy with family friends from Denmark just a couple days after marrying Rachael. For all four in this picture, it was their first time experience fall time in New England. October 2015. In the days after Sergiusz died, I returned to our apartment for a few precious moments at a time to collect belongings. With a numbness, I stared at our bedroom floor, where I had held him as he died. The chair that he had been sitting in when he collapsed was upright once again, pushed towards the desk. On his bedside table was a Nalgene and a copy of Charles Mann’s 1491, which he was slowly making his way through. I opened up the top drawer to find his Polish sim card, a few other knick-knacks and a folded up piece of paper. It was my profession of gratitude from his one Thanksgiving as a proud soon-to-be-American. I sat on the edge of the bed and read through my words over and over again. Our future had been so hopeful. In spite of all of life’s woes, our present had been so positive. In that moment, just days after his death, I felt more deeply about every word I had written than I had the year before. I felt them so much so that I chose to read the piece at his funeral. It was everything we were in life and I didn’t want his death to take that away. Sergiusz, with his parents Danuta and Aleksander, just days after he got married to Rachael. In spite of religious, cultural and language differences, the two families have only become incredibly close. And, their bond has only grown in the wake of Sergiusz’s unexpected death. October 2015. Writing has proved to be my most important source of therapy in the past year. In the same way I used it throughout my relationship to dissect the anxieties, grievances and gratitudes that I had a hard time verbalizing, it has served as an anchor to untangle the deep complexities of my grief. While there are plenty of things I am grateful for in the past year – new friends, new perspectives, a deepened relationship with my in-laws – I am not yet at the point where it flows out with the ease it once did. The guilt and the hurt is too present if I go there. But, what is easy to say outloud, is that I will forever thank myself for putting down those Thanksgiving thoughts on paper in 2015, for that is what I choose to remember.